Thousands of Ethiopians March Against Islamic Extremism turned to violent clash with Police force. Hundreds Arrested. ADDIS ABABA, Ethiopia — More than 100,000 Ethiopians on Wednesday protested the killing of Ethiopian Christians in Libya and their own government's failure to raise living standards of the poor, with poverty fueling the flow of migrants through dangerous areas. The government-supported march at Addis Ababa's Meskel Square turned violent as stone-throwing protesters clashed with the police, who arrested at least 100 people. The protesters said "We want revenge for our sons blood," referring to Ethiopians seen being beheaded or shot in a video released on Sunday by the extremist group Islamic State. The Ethiopian victims are widely believed to have been captured in Libya while trying to reach Europe. 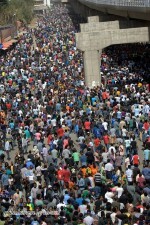 Ahaza Kassaye, the mother of one of the victims identified as Eyasu Yikunoamlak, told The Associated Press during the protest Wednesday that she was overwhelmed by the massive turnout. "I'm happy now. I'm very happy. I was just mourning the death of my son with family members and my neighbors. I never expected this to happen," she said.